I watched the video that said Alyssa visiting April's baby boy. I was wondering if she would wind up trusting her and was happy to see she does! April even walked away and left baby with Alyssa. And baby wasn't afraid of her either. Almost like, wait I know that voice, lol, so you're the one that was talking to me while I was in the belly. Awwww cool!!! Here it is... ganna watch it now, thanks Simba!!! The sweetest pic on the net right now. You are welcome. Adorable! And ITA...it's the sweetest! HARPURSVILLE, N.Y. (AP) - The long-awaited offspring of internet sensation April the Giraffe is being described as strong and "very independent." The owner of Animal Adventure Park in upstate New York says the not-yet-named baby boy was on its feet within an hour after its birth Saturday - and galloping around its mother within three hours. Jordan Patch says he was so excited that he was shaking when he made the calls to assemble the delivery team. Patch says April is "recovering perfectly" following the delivery. Calf continues to grow stronger! We experienced a 1-1 1/2 lb weight gain over night. We are smitten! We will be performing morning calf weigh-in around 8:45 am Eastern if you wish to watch! Photo ad & Baby meet! 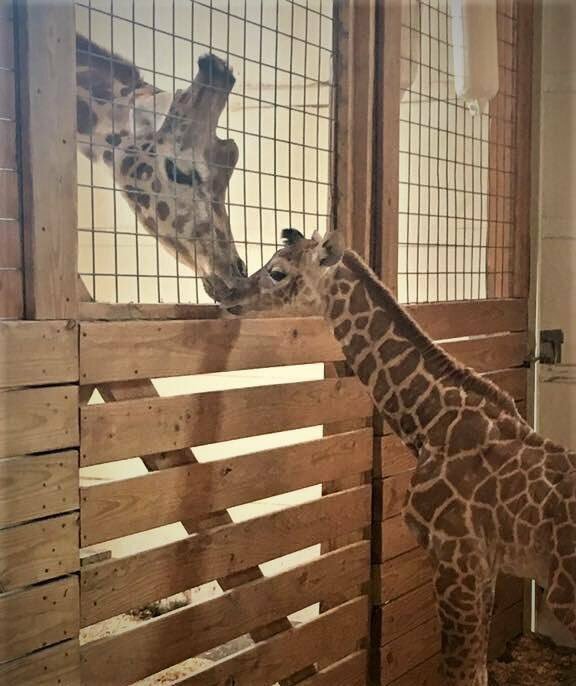 Animal Adventure Park in Harpursville, New York, recently announced on Facebook that it plans to pull the live stream of the mom giraffe’s pen sometime this week, just days after she gave birth to her eagerly awaited baby boy. According to News 10, one of the reasons behind this decision is the reaction to an injury April sustained on Monday. The 15-year-old giraffe twisted her leg, causing her to noticeably favor one of her other long stalks. The zoo said this type of injury is normal for a long-legged animal and is the equivalent to a human rolling their ankle, uncomfortable but temporary. 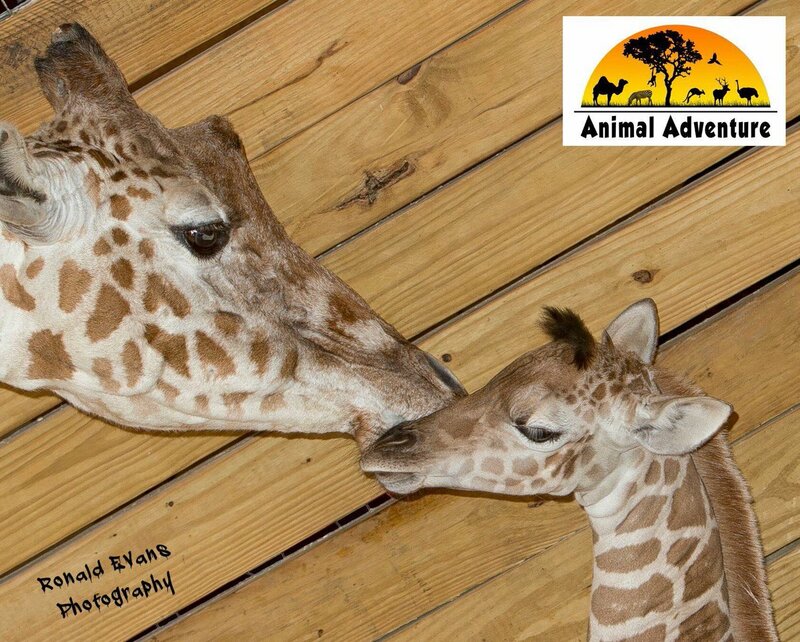 On Tuesday, Animal Adventure Park announced that the mother giraffe’s stance and gait was almost back to normal, but this hasn’t stopped an onslaught of concerned emails. From the beginning, the zoo had planned to pull the live stream about one week after the birth, so keepers could focus on the calf’s care. Now, the live stream will likely end a little earlier, probably between Wednesday or Friday, so the staff can work on preparing the animals and the facility for the park’s reopening for the season in May without distraction. Aside from the slight injury, April and her calf continue to do well and are bonding beautifully. Even dad, who is usually not part of the child rearing process, has shown interest in getting to know the new arrival. HARPURSVILLE, New York (FOX 13) - The internet's two most beloved moms met in person on Tuesday, with both newborn baby boys in tow. That's right. Erin Dietrich, who earned the nickname "Giraffe Mom" after posting a hilarious viral spoof of April the Giraffe, finally got to meet her fellow internet sensation in the flesh. Inside Edition flew Dietrich and her baby boy, Porter, up to Animal Adventure Park in Harpursville, New York from their home in South Carolina. Dietrich met the park's owner, Jordan Patch, and even hand-fed April some lettuce and carrots. The moms and babies posed for pictures and seemed to hit it off. As the petite South Carolina mom stood next to the massive giraffe, you'd never know the two would have so much in common. The live stream of April's long pregnancy helped Dietrich get through hers, she said. (Although, Dietrich had her baby much sooner than April did). Tajiri. Beautiful name meaning hope and confidence. Last edited by Snowshuze; 05-01-2017 at 01:14 PM. Awwww I like that name for him!!! I still like Twiggy but Taj is good! Love the name, it suits him . SPECTRUM NEWS VIDEO: After three months of "April insanity," the world's most famous giraffe is now out for the world to see. Animal Adventure Park opened its doors for the season Monday. The line to get into Animal Adventure Park has stretched into the parking lot. Naturally people are anxious to see Tajiri, April the Giraffe's baby son. Just one month after being born, Tajiri weighs about 180 pounds and stands more than 6 feet, 4 inches tall. They both look great! Love seeing them out in the sunshine . Baby Tajiri is 6 months old today – more little hooves on the way? 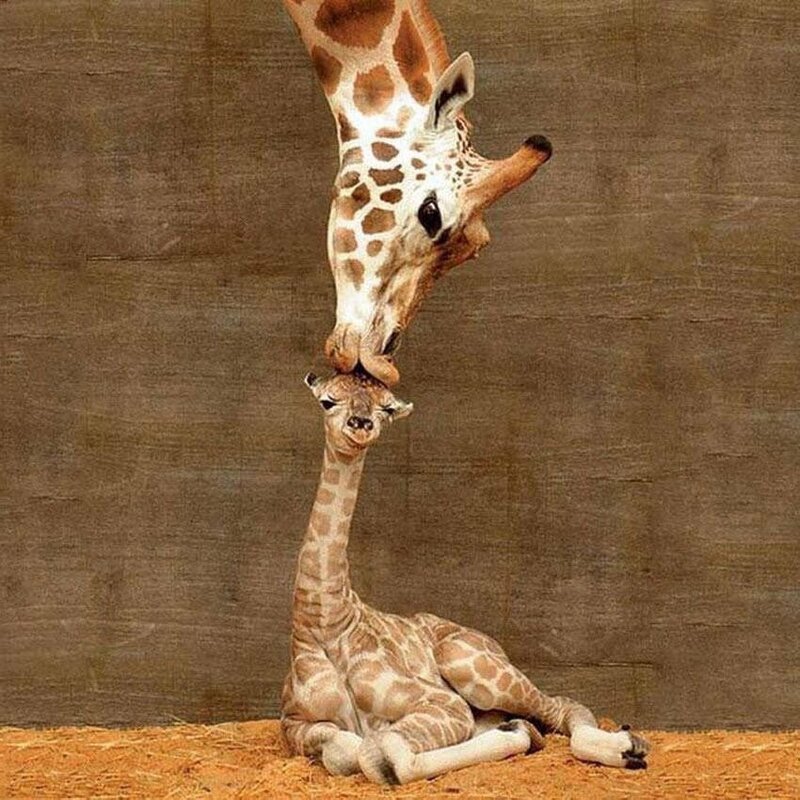 The son of giraffes April and Oliver came into the world six months ago today. According to a post by Animal Adventure Park, Baby Taj now stands almost 10' tall. His personality is "one of independence, a nod to his father Oliver - though his genuine demeanor with guests and keepers is a strong echo of mom, April's, personality." Tatu will be transferred to PA. I really wish they didn't have to separate 'families' but understand why it's done. (WXYZ) - SURPRISE! April the Giraffe may be pregnant again. One of the spokespeople for Animal Adventure Park in New York said on Good Morning America that they "can't confirm nor deny" the possibility of April being pregnant again. April took the world by storm when millions tuned into a live stream daily, waiting for her to go into labor at the zoo. And Dragon posted this one of a new baby in Ohio standing up for the first time....so sweet! Funny too!